Clonal expansion of T cells requires cell division and survival during the proliferative phase of the response. Naive murine CD8 T cells responding to Ag and costimulation undergo an abortive response characterized by impaired clonal expansion, failure to develop effector functions, and long-term tolerance. A third signal provided by IL-12 is required for full expansion, activation, and establishment of memory. The enhanced survival, and thus clonal expansion, supported by IL-12 is not due to increased Bcl-2 or Bcl-xL expression; both are maximally activated by signals 1 and 2. In contrast, Bcl-3, recently shown to enhance survival when ectopically expressed in T cells, is increased only when IL-12 is present. Furthermore, examination of Bcl-3-deficient CD8 T cells demonstrates that the increased survival caused by IL-12 depends upon Bcl-3. The time courses of expression suggest that Bcl-2 and Bcl-xL promote survival early in the response, whereas Bcl-3 acts later in the response. Survival of activated T cells is tightly regulated to insure that adequate clonal expansion occurs to control infections, but that sufficient death occurs to prevent autoimmune responses and shrink expanded populations following Ag elimination. Bcl-2 and Bcl-xL, antiapoptotic members of the Bcl-2 family of proteins, promote survival of T cells, and are up-regulated in response to Ag and costimulation. Adjuvants can also play a critical role in regulating survival of T cells (1, 2), but do not do so by increasing expression of the Bcl-2 family members (3, 4). Mitchell et al. (3) have recently shown that expression of Bcl-3 is up-regulated in Ag-stimulated T cells in an adjuvant-dependent manner and that ectopic expression of Bcl-3 could increase survival of activated T cells, suggesting that this might be a mechanism by which adjuvants increase clonal expansion. Their studies did not define how Bcl-3 gene expression is induced by adjuvants, but they suggested that this might involve the inflammatory environment induced by the adjuvants (3). Curtsinger et al. (5) demonstrated that Ag and B7-1-dependent costimulation (signals 1 and 2) of naive CD8 T cells is not sufficient to stimulate optimal clonal expansion or development of effector functions, but that both occur if IL-12 is present to provide a third signal. Production of IL-12 by APC is one of the components of the inflammatory response induced by many adjuvants, and IL-12 could replace adjuvant in supporting a strong in vivo response by CD8 T cells to peptide Ag (6, 7). Administration of Ag in the absence of adjuvant results in some cell division but clonal expansion is limited, and the cells develop little if any effector function and become tolerant to restimulation (1, 6, 7, 8). When IL-12 is provided along with Ag, strong clonal expansion occurs, effector function develops, and a responsive memory population results (6, 9). Clonal expansion is promoted, in part, by IL-12 enhancing survival of the cells (6). These effects of IL-12 suggested that it might act in part by up-regulating Bcl-3 expression and the results described here demonstrate that this is the case. OT-I mice (10) were housed in a specific pathogen-free environment. C57BL/6 mice were from National Cancer Institute (Frederick, MD). FVB;129P2-BCL-3tm1Ver Bcl-3-deficient (11) and control FVB mice were from The Jackson Laboratory. Naive CD8 T cells were purified by negative selection (12). Artificial APC were prepared by coating microspheres with 2C11 anti-CD3ε mAb (BD Pharmingen) at 1.0 μg/107 beads, or with DimerX H-2 Kb:Ig fusion protein (BD Pharmingen) at 1.0 μg/107 beads. Peptide was loaded onto the H-2Kb by incubating microspheres with 0.1 μM OVA257–264 for 2 h at 37°C. Murine B7-1-Fc (R&D Systems) was coimmobilized at 0.2 μg/107 beads. Ag and B7-1 densities were in the range shown to be effective for T cell stimulation (13). Responder CD8+ T cells (5 × 104) and Ag-coated microspheres (105) were placed in flat-bottom microtiter wells and cultured at 37°C (5). Where indicated, human rIL-2 (2.5 U/ml; R&D Systems), mouse rIL-12 (2.0 U/ml; Genetics Institute, Cambridge, MA), and/or mouse rIL-1 (5 ng/ml; R&D Systems) were added. Proliferation was determined by adding [3H]TdR during the final 8 h of culture. For in vitro survival experiments, equal numbers of live CD8+ T cells that had been cultured for 3 days in wells coated with Ag (0.1 μg/well) and B7 (0.05 μg/well) were washed, labeled with CFSE, and returned to culture in the absence of Ag or cytokines. Survival was measured by counting trypan blue-negative live cells. To measure survival in vivo, OT-1 CD8+ T cells were activated for 3 days in vitro and CFSE labeled (above). Cells were then adoptively transferred by i.v. injection (tail vein) into Thy 1.2+ C57BL/6 recipient mice. OT-1 cells remaining 2–3 days later were identified and quantitated by gating on Thy1 or CD45 congenic markers on the OT-I cells. Expression of mRNA for Bcl-2, Bcl-3, Bcl-xL, and β-actin was determined using a semiquantitative two-step RT-PCR assay. PCR amplification was done using primers designed with Primer3 software (14). Experiments showed that 27 cycles allowed for detection, and normalization to β-actin, within the linear range of amplification. For detection of Bcl-3 by Western blotting, whole-cell lysates from 3 × 106 cells were run on SDS-PAGE gels, transferred to a nitrocellulose membrane and blotted using anti-Bcl-3 Ab (Santa Cruz Biotechnology), and detected using an HRP-conjugated secondary Ab. To determine the requirements for up-regulation of Bcl-3, naive CD8 T cells were purified from C57BL/6 mice and stimulated in vitro with microspheres having immobilized 2C11 anti-CD3ε mAb, with IL-2 alone or along with IL-12 or IL-1. IL-1 was compared with IL-12, because previous work had shown that IL-1 could replace the need for adjuvant in stimulating CD4 T cells, whereas IL-12, but not IL-1, could replace adjuvant for CD8 T cell responses (5). After 72 h, Bcl-3 mRNA and protein levels were examined. A low level of Bcl-3 mRNA was detected in unstimulated cells, and increased little if at all upon stimulation with anti-TCR and either IL-2 or IL-2 and IL-1 (Fig. 1⇓A). In contrast, there was a large increase when IL-12 was present. In three independent experiments, addition of IL-12 caused a 5.0 ± 0.8-fold change in mRNA expression level, whereas IL-1 caused no significant change. Similar results where obtained when Bcl-3 protein levels were examined by Western blotting (Fig. 1⇓, B and C). In five independent experiments, IL-12 caused a similar increase in Bcl-3 protein, whereas IL-1 caused no significant increase in the four experiments where it was examined. Based on densitometric scans, with background subtracted, the average increase in Bcl-3 protein expression in cells stimulated in the presence of IL-2 and IL-12 was 3.2 ± 0.1-fold in comparison to cells stimulated with only IL-2, and the increase was 3.3-fold in the experiment shown in Fig. 1⇓B. 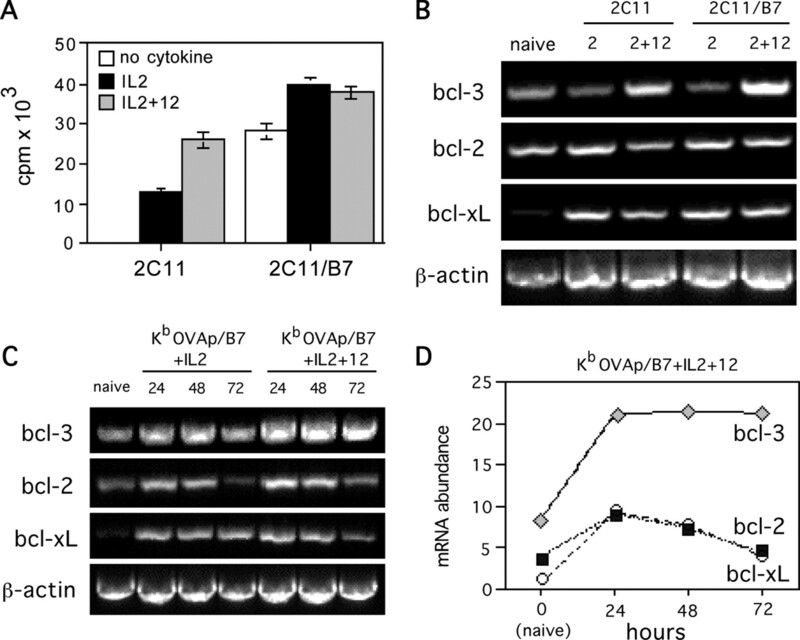 IL-12 up-regulates Bcl-3 expression in activated naive CD8 T cells. A, Purified naive CD8 T cells were stimulated with microspheres coated with 2C11 anti-CD3ε mAb. IL-2 was added alone, or along with IL-I or IL-12, as indicated. Cells were harvested after 72 h and analyzed for Bcl-3 and β-actin mRNA expression by RT-PCR. B and C, Cells were stimulated as in A, and Bcl-3 protein expression was analyzed after 72 h by Western blotting. The specificity of the anti-Bcl-3 polyclonal Ab was confirmed by preincubating the Ab with a blocking peptide for 30 min. Numbers indicate intensity of bands relative to that of naive cells without peptide blocking. B7 costimulation and IL-2 stimulate increased production of Bcl-2 and Bcl-xL in T cells (15). Therefore, we tested whether B7-1 had a similar effect on Bcl-3 mRNA, and whether IL-12 could up-regulate Bcl-2 or Bcl-xL. Naive OT-I T cells specific for H-2Kb/OVA257–264 (10) were stimulated with either 2C11 mAb or Kb/OVAp on microspheres, either alone or along with B7-1. The efficacy of the coimmobilized B7-1 was confirmed by the fact that substantial proliferation occurred without cytokines when B7-1 was present (Fig. 2⇓A). Similar results were obtained using Kb/OVAp vs Kb/OVAp/B7 microspheres (data not shown). Effects of B7.1 costimulation and IL-12 on Bcl-3, Bcl-2, and Bcl-xL mRNA expression. Microspheres coated with 2C11 anti-CD3ε mAb or Kb/OVAp either alone or with B7.1-Ig were used to stimulate naive OT-1 cells in the presence of IL-2 and IL-12, as indicated. A, Proliferation of CD8 T cells responding to 2C11 mAb. Identical results were obtained when DimerX Kb/OVAp was used as the stimulus (not shown). B, Cells were harvested at 72 h and analyzed for Bcl-3, Bcl-2, and Bcl-xL mRNA expression by RT-PCR. C, Cells were harvested every 24 h for a period of 3 days and analyzed as in B. D, Expression of Bcl-3, Bcl-2, and Bcl-xL mRNA was analyzed by RT-PCR as in C, and the bands were quantitated by densitometry. mRNA abundance is expressed relative to actin (×10). Naive cells had low but detectable levels of Bcl-3, Bcl-2,and Bcl-xL mRNA (Fig. 2⇑B). Stimulation for 72 h with 2C11 andIL-2 up-regulated Bcl-xL and Bcl-2 mRNA expression and B7-1 did not further increase these levels, whereas Bcl-3 mRNA expression did not increase in response to these stimuli. In contrast, addition of IL-12 resulted in strong up-regulation of Bcl-3 mRNA, by 2.4-fold for 2C11 stimulation and 3.0-fold for 2C11/B7 stimulation based on densitometric scans. Addition of IL-12 did not increase Bcl-2 or Bcl-xL mRNA levels and, in most experiments, caused a small decrease. The experiment shown in Fig. 2⇑B examined mRNA expression levels at 72 h, late in the response when proliferation is maximal and lytic effector function has developed. To determine how expression is regulated during the response, naive OT-I cells were stimulated with Kb/OVAp and examined at 24, 48, and 72 h (Fig. 2⇑C). Bcl-2 and Bcl-xL mRNA levels increased strongly by 24 h and then declined, and IL-12 had little or no effect. Some up-regulation of Bcl-3 mRNA occurred early in the absence of IL-12, but declined by 72 h. In contrast, IL-12 stimulated strong and sustained up-regulation of Bcl-3 mRNA levels. Fig. 2⇑D shows the time course for mRNA expression levels for the survival proteins in response to Kb/OVAp/B7 and IL-12, the condition that leads to maximal clonal expansion and effector function. Thus, Bcl-2 and Bcl-xL mRNAs are up-regulated early in the response by signals 1 and 2 and then decline, whereas Bcl-3 mRNA expression is strongly up-regulated only by IL-12, and is sustained late in the response. Ectopic expression of Bcl-3 enhances survival of activated T cells (3), suggesting that IL-12 might sustain survival at later times to support maximal clonal expansion by up-regulating Bcl-3 expression. To determine whether IL-12 does provide a survival advantage, we examined survival of OT-I T cells following activation with Kb/OVAp/B7 for 72 h, when expansion has peaked and the cells begin to die (data not shown). To examine survival in the absence of continued exposure to Ag, cells were activated for 72 h in microtiter wells having immobilized Kb/OVAp/B7. Cells were then harvested, washed to remove cytokines, and placed in secondary cultures in fresh medium, and the number of live cells remaining was determined over 2 days. We consistently found that cells stimulated in the presence of IL-12 for the first 72 h survived better during the subsequent 2-day period in culture (Fig. 3⇓A). To determine whether greater cell recovery in the secondary cultures might be due to more proliferation during this 2-day period, cells were labeled with CFSE at the end of the 72-h primary culture. Dilution of CFSE showed that the cells undergo one to two additional rounds of division following transfer to secondary cultures, but this did not differ for cells initially grown in the presence or absence of IL-12 (Fig. 3⇓B). Thus, differential recovery during the secondary culture reflects differences in the ability of the cells to survive. Naive CD8 T cells activated in the presence of IL-12 have enhanced survival upon Ag and cytokine withdrawal. A, Naive OT-I CD8 T cells were activated in primary cultures using plate-bound Kb/OVAp and B7.1 plus IL-2, in the presence or absence of IL-12. After 72 h, cells were harvested and washed, and CFSE-labeled, and equal numbers of live cells (40 × 103) were transferred to secondary cultures lacking Ag or cytokines. The numbers of live cells remaining posttransfer are shown as the average and SD of triplicate samples. Results are representative of three independent experiments. B, Cells in A were analyzed by flow cytometry at 30 h posttransfer to determine CFSE levels. Open histograms are CFSE levels of cells immediately following CFSE labeling. C, Naive OT-I Thy 1.2+CD45.1+ CD8 T cells were stimulated in vitro in the absence of IL-12, and OT-I Thy 1.1+CD45.2+ cells were stimulated in the presence of IL-12. After 72 h, cells were harvested and washed, labeled with CFSE, mixed in equal numbers, and adoptively transferred into C57BL/6 (Thy 1.2+CD45.2+) recipients (0.8 × 106 of each cell type). After 48 h, cells were harvested from the indicated organs, and the numbers of OT-I Thy 1.2+CD45.1+ and OT-I Thy 1.1+CD45.2+ cells were determined by flow cytometry. Similar results were obtained in an independent experiment, and in three additional experiments examining lymph nodes and spleens only. D, CFSE dye dilution in the OT-I cells described in C. Shaded histograms are CFSE levels of cells immediately following CFSE labeling; gray lines are cells stimulated with IL-2 and IL-12; black lines are cells stimulated with only IL-2; and dotted lines are endogenous CD8 T cells. 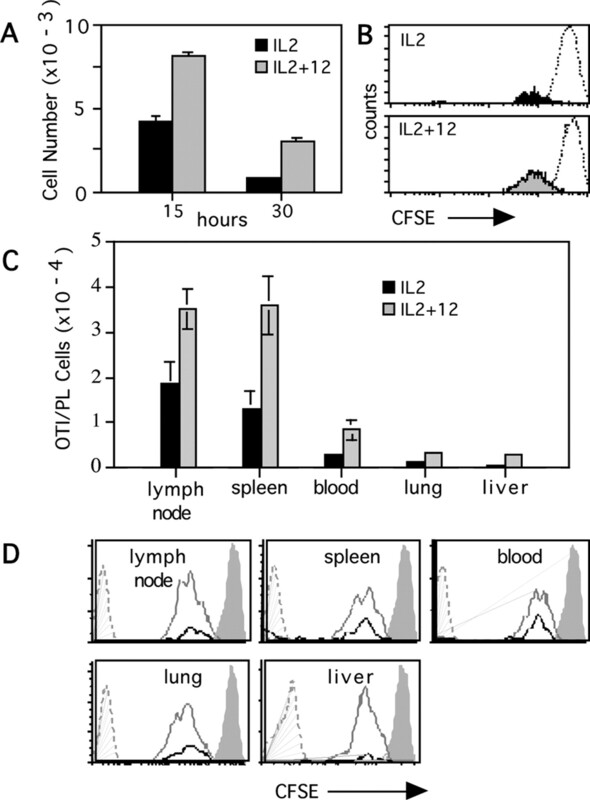 OT-I cells stimulated in the presence of IL-12 for 72 h also survived better when they were then adoptively transferred into mice and recovered from the lymph nodes, spleens, blood, lungs, and livers 48 h later (Fig. 3⇑C). Again, CFSE dilution indicated that there was no significant difference in the extent of cell division that could account for the differential recovery of the two populations (Fig. 3⇑D). These results suggest that signals derived from IL-12 confer a survival advantage to activated cells that allows them to survive longer in an in vivo environment. To determine whether the survival advantage provided by IL-12 is due to up-regulation of Bcl-3, CD8 T cells from wild-type and Bcl-3-deficient mice were compared. For these experiments, immobilized 2C11 anti-CD3ε mAb was used to provide signal 1 for polyclonal activation of the naive CD8 T cells. As expected, activated T cells from FVB wild-type mice survived better in secondary cultures when they received an IL-12 stimulus during the primary culture (Fig. 4⇓A), and this was not due to differential cell division (B). In contrast, the IL-12-dependent survival advantage was lost in cells that lacked Bcl-3. IL-12-dependent enhancement of survival requires Bcl-3 expression. Naive CD8 T cells from Bcl-3−/− and wild-type FVB mice were activated in primary cultures using plate-bound 2C11 mAb and B7.1 plus IL-2, in the presence or absence of IL-12. After 72 h, the cells were harvested and washed, and CFSE-labeled, and equal numbers of live cells (40 × 103) were transferred to secondary cultures lacking Ag or cytokines. A, The numbers of live cells remaining posttransfer are shown as the average and SD of triplicate samples. Results are representative of three independent experiments. B, Cells in A were analyzed by flow cytometry at 36 h posttransfer to determine CFSE levels. Open histograms are CFSE levels of cells immediately following CFSE labeling. IL-12 acts as a required third signal along with TCR engagement and costimulation to activate naive CD8 T cells to clonally expand and develop effector functions in vitro (5, 12) and in vivo (6, 7, 9). IL-12 has multiple effects including up-regulation of CD25 to higher levels than are reached in response to signals 1 and 2, allowing vigorous proliferation in response to the low levels of IL-2 produced by CD8 T cells (12). In addition, it is essential for development of cytolytic function and IFN-γ production (5, 6). As shown here, it also up-regulates Bcl-3 to promote survival of the activated cells. That Bcl-3 might act as a survival factor for activated T cells was suggested by experiments examining ectopic expression (3), and our results demonstrate that this is in fact the case for CD8 T cells undergoing a physiological response to Ag. The Bcl-2 and Bcl-xL survival factors for activated T cells are up-regulated by TCR engagement and costimulation, with signal 3 having little or no effect (Fig. 2⇑), in agreement with a previous report showing that IL-12 does not affect expression of these proteins (16). In contrast, Bcl-3 up-regulation depends on signal 3 and occurs later in the response, with optimal expression at day 3. These results agree well with those of Marrack and coworkers (2) demonstrating that adjuvants have little or no effect on Bcl-2 and Bcl-xL expression, but strongly up-regulate Bcl-3 (3). The timing of expression suggests a model in which the different survival factors have roles at distinct stages in the response, and in vivo studies of the effects of signal 3 on responses of CD8 T cells are consistent with this (6). Our previous work showed that immunization with peptide Ag alone or along with IL-12 resulted in comparable proliferation and clonal expansion (cell numbers) of Ag-specific CD8 T cells by day 2, suggesting that the cells survive equally well with or without signal 3 at this time, with survival likely being promoted by Bcl-2 and Bcl-xL. Between days 2 and 3, the cells underwent further proliferation to a comparable extent but cell numbers did not increase unless IL-12 was provided, suggesting that survival was compromised late in the response in the absence of the third signal (6), and thus in the absence of Bcl-3 up-regulation. Differing expression kinetics of survival factors is likely related to the fact that T cells undergo a series of distinct pro- and antiapoptotic programs during a response (17). Early in the response TCR- and Fas/TNFR-dependent death pathways may activate caspase 8, which can be counteracted by the up-regulation of FLIP, a nonenzymatic analog of procaspase 8 (18). A recent study showed that IL-12 can up-regulate FLIP expression in CD8 T cells (16). This could contribute to enhanced early survival, although we do not see large signal 3-dependent differences in clonal expansion at early times, and the Fas pathway may not contribute substantially to the death of activated T cells (19). Later in the response, cytokine withdrawal leads to activation of death pathways, which can be counteracted by the action of the antiapoptotic Bcl-2 family members (17, 19). 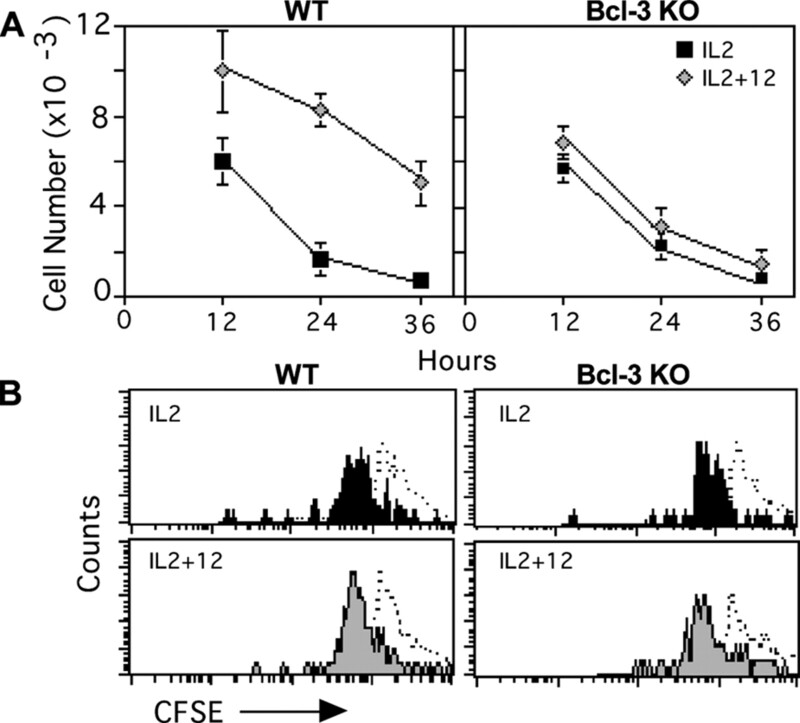 Bcl-2 is up-regulated by IL-2, and its down-regulation toward the end of the response (Fig. 2⇑) may coincide with IL-2 depletion, consistent with decreased levels of Bcl-2 in T cells at their peak of activation (20, 21). It appears that Bcl-3 becomes a critical survival factor at this time (Figs. 3⇑ and 4⇑). Unlike Bcl-2 and Bcl-xL, Bcl-3 is unlikely to act directly to inhibit apoptosis. Rather, Bcl-3 is a member of the IκB protein family and can interact with p50 and p52 NF-κB complexes to repress or induce gene transcription (22, 23). Thus, Bcl-3 may regulate expression of one or more genes involved in survival, which could include up-regulation of antiapoptotic proteins or down-regulation of proapoptotic proteins such as Bim (19) or other members of the Bcl-2-related family of proteins. Most studies examining the role of NF-κB complexes in T cell survival have focused on NF-κB heterodimers containing the canonical p65 (relA) subunit (24, 25). Our results and those of Mitchell et al. (3, 4) suggest that NF-κB complexes that depend upon Bcl-3 transactivation may also play critical roles. In addition to regulating survival genes, Bcl-3 may regulate genes required for other signal 3 effects on CD8 T cells including effector functions, avoidance of tolerance, and acquisition of memory. Experiments are in progress to examine genes whose expression is regulated by Bcl-3. We thank Susanna Winston for expert technical assistance. ↵1 This work was supported by National Institutes of Health Grants AI34824 and AI35296 (to M.F.M.). ↵2 Current address: Department of Biological Sciences, Columbia University, New York, NY 10027. Mitchell, T., J. Kappler, P. Marrack. 1999. Bystander virus infection prolongs activated T cell survival. J. Immunol. 162:4527. Mitchell, T. C., D. Hildeman, R. M. Kedl, T. K. Teague, B. C. Schaefer, J. White, Y. Zhu, J. Kappler, P. Marrack. 2001. Immunological adjuvants promote activated T cell survival via induction of Bcl-3. Nat. Immunol. 2:397. Mitchell, T. C., T. K. Teague, D. A. Hildeman, J. Bender, W. A. Rees, R. M. Kedl, B. Swanson, J. W. Kappler, P. Marrack. 2002. Stronger correlation of bcl-3 than bcl-2, bcl-xL, costimulation, or antioxidants with adjuvant-induced T cell survival. Ann. NY Acad. Sci. 975:114. Curtsinger, J. M., C. S. Schmidt, A. Mondino, D. C. Lins, R. M. Kedl, M. K. Jenkins, M. F. Mescher. 1999. Inflammatory cytokines provide a third signal for activation of naive CD4+ and CD8+ T cells. J. Immunol. 162:3256. Curtsinger, J. M., D. C. Lins, M. F. Mescher. 2003. Signal 3 determines tolerance versus full activation of naive CD8 T cells: dissociating proliferation and development of effector function. J. Exp. Med. 197:1141. Schmidt, C. S., M. F. Mescher. 1999. Adjuvant effect of IL-12: conversion of peptide antigen administration from tolerizing to immunizing for CD8+ T cells in vivo. J. Immunol. 163:2561. Kyburz, D., P. Aichele, D. E. Speiser, H. Hengartner, R. M. Zinkernagel, H. Pircher. 1993. T cell immunity after a viral infection versus T cell tolerance induced by soluble viral peptides. Eur. J. Immunol. 23:1956. Schmidt, C. S., M. F. Mescher. 2002. Peptide antigen priming of naive, but not memory, CD8 T cells requires a third signal that can be provided by IL-12. J. Immunol. 168:5521. Hogquist, K. A., S. C. Jameson, W. R. Heath, J. L. Howard, M. J. Bevan, F. R. Carbone. 1994. T cell receptor antagonist peptides induce positive selection. Cell 76:17. Schwarz, E. M., P. Krimpenfort, A. Berns, I. M. Verma. 1997. Immunological defects in mice with a targeted disruption in Bcl-3. Genes Dev. 11:187. Valenzuela, J., C. Schmidt, M. Mescher. 2002. The roles of IL-12 in providing a third signal for clonal expansion of naive CD8 T cells. J. Immunol. 169:6842. Tham, E. L., P. L. Jensen, M. F. Mescher. 2001. Activation of antigen-specific T cells by artificial cell constructs having immobilized multimeric peptide-class I complexes and recombinant B7-Fc proteins. J. Immunol. Methods 249:111. Rozen, S., H. Skaletsky. 2000. Primer3 on the WWW for general users and for biologist programmers. Methods Mol. Biol. 132:365. Mueller, D. L., S. Seiffert, W. Fang, T. W. Behrens. 1996. Differential regulation of bcl-2 and bcl-x by CD3, CD28, and the IL-2 receptor in cloned CD4+ helper T cells: a model for the long-term survival of memory cells. J. Immunol. 156:1764. Lee, S. W., Y. Park, J. K. Yoo, S. Y. Choi, Y. C. Sung. 2003. Inhibition of TCR-induced CD8 T cell death by IL-12: regulation of Fas ligand and cellular FLIP expression and caspase activation by IL-12. J. Immunol. 170:2456. Hildeman, D. A., Y. Zhu, T. C. Mitchell, J. Kappler, P. Marrack. 2002. Molecular mechanisms of activated T cell death in vivo. Curr. Opin. Immunol. 14:354. Algeciras-Schimnich, A., T. S. Griffith, D. H. Lynch, C. V. Paya. 1999. Cell cycle-dependent regulation of FLIP levels and susceptibility to Fas-mediated apoptosis. J. Immunol. 162:5205. Broome, H. E., C. M. Dargan, S. Krajewski, J. C. Reed. 1995. 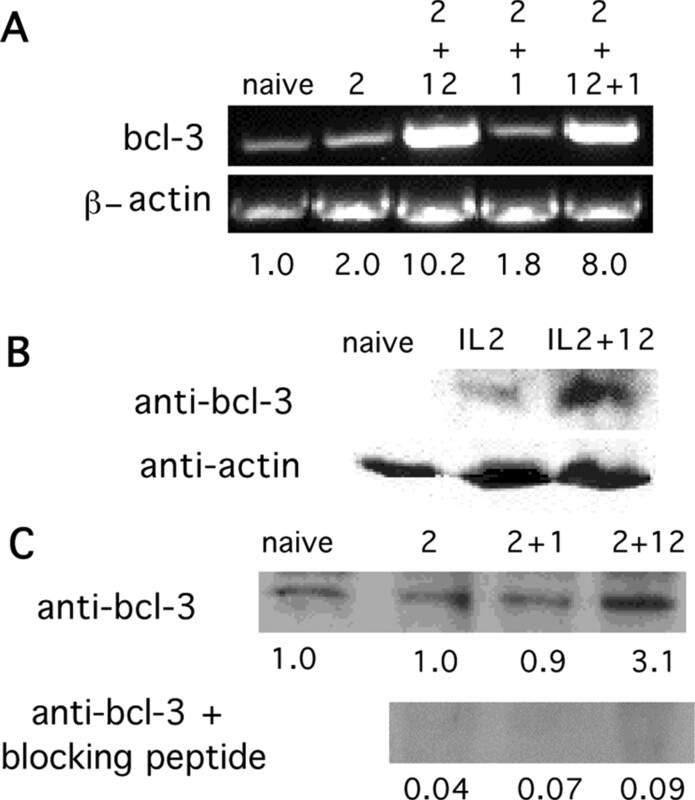 Expression of Bcl-2, Bcl-x, and Bax after T cell activation and IL-2 withdrawal. J. Immunol. 155:2311. Marrack, P., J. Kappler, T. Mitchell. 1999. Type I interferons keep activated T cells alive. J. Exp. Med. 189:521. Franzoso, G., L. Carlson, T. Scharton-Kersten, E. W. Shores, S. Epstein, A. Grinberg, T. Tran, E. Shacter, A. Leonardi, M. Anver, et al 1997. Critical roles for the Bcl-3 oncoprotein in T cell-mediated immunity, splenic microarchitecture, and germinal center reactions. Immunity 6:479. Nolan, G. P., T. Fujita, K. Bhatia, C. Huppi, H. C. Liou, M. L. Scott, D. Baltimore. 1993. The bcl-3 proto-oncogene encodes a nuclear IκB-like molecule that preferentially interacts with NF-κB p50 and p52 in a phosphorylation-dependent manner. Mol. Cell. Biol. 13:3557. Karin, M., A. Lin. 2002. NF-κB at the crossroads of life and death. Nat. Immunol. 3:221.